When you travel to a new country, one of the key questions is what you should eat. Well, let’s see what to eat in Colombia. The first thing you should know is that Colombian gastronomy is very tasty and varied. In Colombia you have an enormous variety of things to eat, and so, this is one of the reasons to visit the country. As we mentioned at the start of this article, Colombian gastronomy is very tasty and highly thought of. According to the region, you visit there are a series of dishes to try if you want to immerse yourself fully in the flavors of the region. But let’s talk about traditional Colombian dishes, what they are and why they are so appealing. Stew pots come in many forms, but in general, they are made with beans. This is a typical dish of the mountain areas which contains pork, banana, and avocado on a base of beans. Minced meat and potatoes are added, and it is served with rice and salad. This is a somewhat filling dish which can also be made with fish and seafood. In many places, tamales are the main meal of the day. They are made with pieces of cooked potato, carrot, and peas with marinated meat all wrapped in a maize dough. The maize wrap is then wrapped in a banana leaf, which also serves as a dish. Another common variation is using rice as a replacement for the maize wrap. 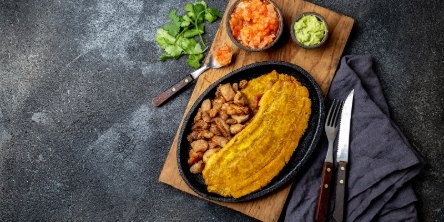 Patacones are fried green bananas which are served with meat or chicken, along with guacamole. When the bananas are still green they become crunchy when fried, and they provide a special touch to the dish. Another traditional Colombian dish is the Sancocho, a soup based on potatoes, yucca, bananas, and beef. This soup or stew is mostly served with rice. The Ajiaco is a typical dish from Bogotá which contains three types of potato, corn cob and chicken. Soup is made with these ingredients and this is accompanied with rice, cream, and capers. If you want to try an authentic and one of the most traditional dishes of Colombian gastronomy, the Bandeja Paisa is perfect. This large dish is a blast of carbohydrates and proteins. Its ingredients include beans, rice, meat, black pudding, chorizo, pork, fried egg, fried banana, avocado and it is accompanied by a corn tortilla. Although its name is a little strange, this dish is typical of Colombian gastronomy and is nothing but soup. It is made with cow’s intestines, which is where its strangeness lies. You won’t find it everywhere, and it is recommended that you choose a good place to try it. As well as tripe, the sauce also has potatoes and boiled vegetables. Fish is another undisputable protagonist of Colombian cuisine. Catfish in the sauce is one of the most popular freshwater fish dishes. The seafood stew comes from the town of Riohacha, while in the Amazon, the Pirarucú fish is served as fillets. Although the Ceviche is not an exclusively Colombian dish, it is very famous throughout the country, particularly the prawn Ceviche. It is served in a glass and includes tomato sauce, lemon, onion, garlic, and spices which give it a particularly strong flavor. It is perfect to try accompanied by a small glass of Colombian firewater. Another popular dish from the island of Barú is fried fish with rice and fried bananas. Coconut is used to cook the rice, which gives it a special flavor. The fresh fish is served fried with fried bananas, and it is a flavorsome and very nutritious dish. Lastly, although meat is abundant in the country, vegetarians and vegans can substitute it for corn tortillas. Another typical Colombian dish, which is not exclusive to this Latin American country is arepas. These are corn tortillas which can be filled with almost anything. They are served at any time and can be eaten for breakfast, lunch or dinner. In some areas of Colombia, tortillas are served roasted with butter, salt, and white cheese. The difference between these and Venezuelan corn tortillas is that the latter are stuffed, while the Colombian tortillas are open. There are other exquisite foods, such as pan de queso (cheese bread), almojábanas (cheese buns), buñuelos (fritters), obleas (wafers) or alfajores (sweet pastries). All these without even beginning to talk about the desserts: the Arequipa (creamy evaporated milk dessert), the rice pudding, the Mazamorra (grains of maize cooked in milk), the Cocadas (coconut dessert) and the famous Aguapanela (sugar cane dessert). 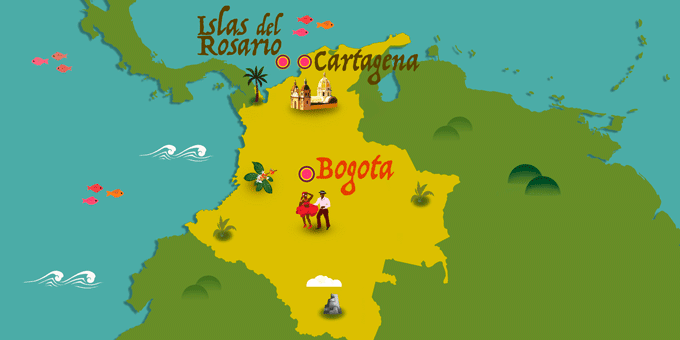 If Colombia has caught your attention, leave us your number so we can call you to discuss the voyage that awaits you.